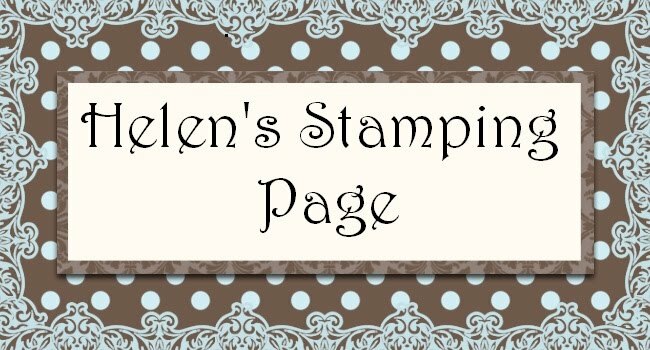 This card is made using the Seeing Spots and Think Happy Thoughts stamp sets. I cut a piece of Whisper White 9.5cm x 14cm and stamped the images from Seeing spots randomly on the white card with Basic Black ink. I then cut 2 strips of black card 1cm x 9.5cm and adhered them to the card as shown, leaving a gap for the ribbon and Happy Birthday sentiment. 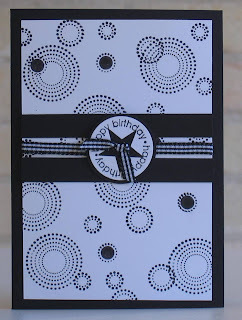 I then stamped Happy Birthday in black on whisper white punched the centre out with the small star punch and then used the circle punch to punch the Happy Birthday out. This was then placed on a larger circle of black. Using my cropodile I punched 2 holes in the centre side by side so I could thread my gingham ribbon through either hole and tie a not. Either side of the ribbons are attached to the back of the whisper white card and secured down with adhesive the whisper white card is then adhered to the Black base card.